Sunday was a slow state-level polling day until things picked up later in the evening with seven new poll releases from six mostly toss up states. If the resulting FHQ weighted averages did not have the states in toss up territory then the actual poll results themselves did, more often than not. Other than the occasional primary red shaded polling margins -- a Lean Romney -- most of the Florida polling falls into the toss up area. And following the first presidential debate in Denver, most of those have tipped toward Governor Romney. Rarely are there Obama leads anymore, but when they do pop up, most are either outliers, or as we said in reference to the Survey USA poll released yesterday (Obama +1), serve as the current best case scenario for the president. Given that range, the PPP fits and the Grove Insight addition falls on the outside looking in. 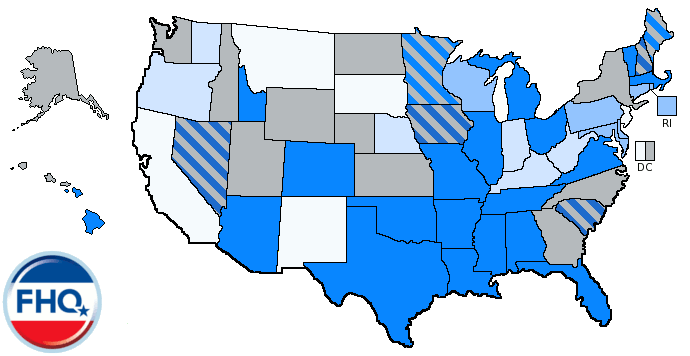 But then again, Grove has polled a number of toss ups recently and found a fairly uniform Obama +3 lead (see FL, NC & WI). 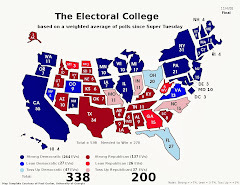 That is not in keeping with the order of states that has been established in our Electoral College Spectrum below. If North Carolina was Obama +3, then Florida would be Obama +4-5 and Wisconsin would be Obama +8 or so. Those numbers don't jibe with the reality on the ground. Then again, neither do FHQ's. Ours, however, are tracking downward toward zero or a Romney lead. PPP apparently had two surveys in the field simultaneously in Iowa over the weekend: one they had already scheduled and one for Health Care for America Now. Both were extremely similar, but the sponsored survey above shows Obama up by a point instead of Romney up by a point. There was some discussion/mocking in the Twitterverse about the differences between the polls and their results, but the reality is that the differences are merely polling variability. If anything should be questioned it is the simultaneity. But why knock the extra data? The bottom line in Iowa? Things have tightened up. There have been seven post-debate (Denver) polls and only one has found the lead to be greater than four points. Only three have the lead higher than three points. That means a small majority have the president's advantage under three points. All show Obama in the lead or tied. This is now the fourth consecutive poll to find the president's share of support at 52%. [YouGov, EPIC/MRA and Rasmussen were the other three.] If that is the state of play in the Great Lakes state, then the Romney campaign's quandary, to the extent they want to confront it in the waning days of this campaign, is not only that it has ground to make up, but that it has to bring the president down in the process. That's a tough spot to be in with just 16 days left until election day. Of course, there really isn't much of a signal from the Romney campaign that they are playing in Michigan or that it is necessary to get the Republican nominee to 270 electoral votes. The competitive senate race in the Show Me state is keeping a steady flow of presidential-level polling data coming out of Missouri. And on some level, it is nice to get the data, but the reality is that the picture is not changing all that much. Missouri continues to be a fine example of the uniform national swing back to the Republicans in 2012 as compared to 2008. A state that just barely went for McCain four years ago is a comfortable lean state at the presidential level for Romney and the Republicans now. There has been a consistent range in Missouri polling margins from the mid- to upper single digits to the low teens and that does not appear to be in danger of changing and did not in the PPP survey above. The other just-released poll from the internet-based polling firm, Angus-Reid, is out of Ohio. As was the case with the Grove series of polls it is helpful to eye ball the margin between the two surveys from the firm in Michigan and Ohio. Ohio is closer than Michigan with a tie between Obama and Romney, but the Michigan result is a little high and the Ohio margin a little low as compared to the FHQ weighted averages. 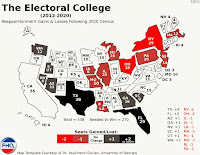 However, neither is outside of the range of polling in each state that has been established throughout 2012 and especially after the first presidential debate. This is also the second tied Ohio poll in as many days and drops the weighted average just a step further. FHQ won't dwell on the Grove Insight survey of Wisconsin. Either Florida is Obama +3 and the Wisconsin lead is even tighter in the president's direction or Wisconsin is Obama +3 and Florida is tied or more accurately slightly in Romney's column. But realistically it probably isn't both and both states are definitely not +3. If one of them is then it is Wisconsin. 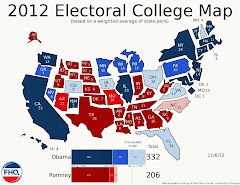 It was another day of no change to the map, the tally or the Electoral College Spectrum. As we have mentioned, the ordering of states has reached an almost "baked in" point. We have mentioned the idea of tiers of states before (see the Ohio discussion from yesterday's post) and while there may be some shuffling within tiers at this point, there is likely not going to be a whole lot in the way of "tier jumping" with just more than two weeks left before votes are cast. That does not mean that there can't or won't be any significant movement, but it does mean that it just isn't that likely. We're running out of time here, folks. The fact that the averages are compressing as we come down the stretch is normal on the one hand (narrowing), and in a race in which the fundamentals point toward it being very tight indeed, that may bring a lot of these tiers and states closer together creating some election day shuffling. As was the case on Saturday, the Watch List stayed the same on Sunday. It is still probably a matter of when not if Florida will slide over into the Romney side of the partisan line, and perhaps, when not if Colorado and Virginia come on to the list. Ohio, too, is close to moving off the list, more firmly into the Toss Up Obama category. Those states along with Nevada, New Hampshire and Wisconsin are ones where new polling data could make a difference in the FHQ weighted averages.